There’s a well-thumbed story that the Black Sabbath song Iron Man was inspired by the Marvel Comics character of the same name. But it’s not true. 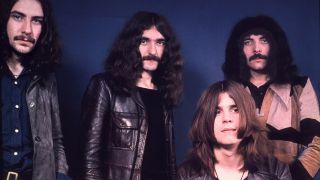 Although Marvel had established that superhero in 1963, Sabbath bassist Geezer Butler, who wrote the lyrics for the iconic song, had never even heard of him in 1970. “My parents never let me read American comics when I was growing up,” he says. The idea for Iron Man (which first appeared on the second Black Sabbath album, Paranoid, released in 1970), actually started with Ozzy Osbourne. The storyline – a self-fulfilment prophecy, mixed up with time travel – is actually quite complex. It’s about a man who goes into the future and witnesses the apocalypse. Going back to his own time, he encounters a rogue magnetic field, which turns him into a mute, steel creature. Unable to talk, he still tries to warn people about the impending end of the world, but is only mocked for his troubles. Angry and bitter, he eventually causes the devastation he’d warned everyone about. Ultimately the would-be hero becomes the villain. “I was heavily into science fiction at the time,” Butler recalls of almost 50 years ago. “Remember, this was the era of the space race,” he says. “A lot of the stuff I was writing about was inspired by those sorts of stories. I was fascinated by what might happen to a man who’s suddenly transformed into a metal being. He still has a human brain, and wants to do the right thing, but eventually his own frustrations at the way humanity treats him drives this creature to taking extreme action. It’s almost a cry for help. Former Sabbath drummer Bill Ward reckons that, musically, the song was nothing like anything else the band had done up to that point: “For me, this is a special song for the band. It was just so different. As soon as you hear that ominous start, you know something’s building. For me, the drumming was a real challenge to get right in the studio. But it’s also a drummer’s dream to play. Over the years, Iron Man has become not only one of the cornerstones of the Sabbath catalogue, but also credited as one of the most important songs in the history of metal. For Geezer Butler, it is perhaps the track that bests sums up the band. Bill Ward believes that the song’s stature has grown over the years, to the point where it has now gone beyond being just a great Sabbath song. In 2008, Iron Man received another boost when it was included in the movie of the same name, based on the Marvel Comics creation. That delighted Butler. “It was a recognition of just how much the song means,” he says with pride. “When you have such a major film using it, then it does introduce it to a new generation, kids who perhaps aren’t aware of who Black Sabbath are but who might be tempted to go and check us out. Sabbath released Iron Man as a single in 1971. Although it reached No.52 in America (nine places higher than Paranoid), in the UK it make no impact at all.